A few months ago, I joined a Steampunk Swap in the Odd Duck Swaps group on Ravelry. My swap target (or “spoilee”) was very talkative and fun, so I got loads of ideas for what to make for her. One thing she mentioned caught my fancy right away as a great opportunity to set a design challenge for myself. 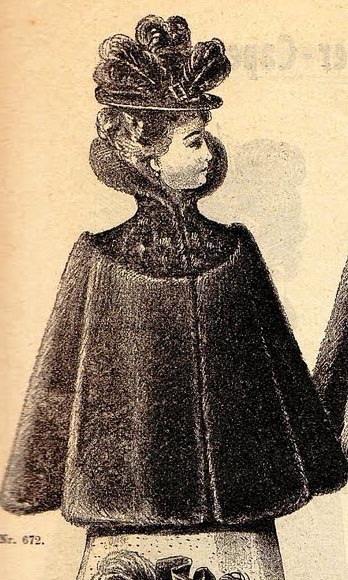 The inspiration started with a page of illustrations of Victorian capes that my “spoilee” had posted. One caught my eye immediately. So gorgeous! I loved the high neck, the tailored look, the weighty drape of the luxurious fabric (presumably fur, in the original). I imagined that this would be a lined cape that would keep a lady warm on the coldest winter strolls, and yet be easily tossed aside for a waltz with a beau.